This tour includes roundtrip transportation from Orlando, a KSC admission pass, the lunch with the Astronaut Experience as well as the NASA UPCLOSE bus tour. The Ultimate Experience for Space Enthusiasts - a SPACE PASS. 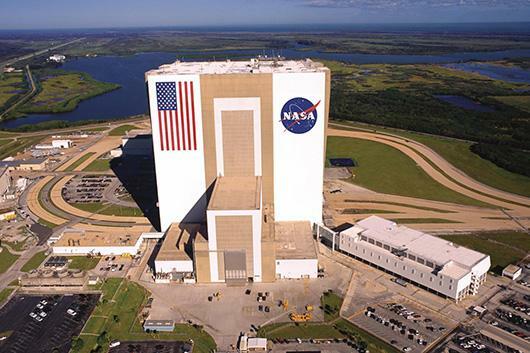 The NASA UPCLOSE bus tour takes you right to the launch pads, it is a two hour fully guided bus tour within Kennedy and if you really want to experience Kennedy yet don't necessarily wish to walk around and read the exhibits yourself then this is your opportunity. This is a compact day to fit everything is but if you really want to see the best that Kennedy has to offer then this is the day you should book! The landmark Vehicle Assembly Building at Kennedy Space Center can be seen from miles away and is one of the first things you'll see on the bus from Orlando. The Dine with an Astronaut Lunch is served buffet style. During the delicious meal, one of NASA's bests will share personal stories and presentations. It's an up-close and personal opportunity to meet and speak with an astronaut. Get autographs and have photos taken together. KSC has a lot for entire family. We were family if 4. Lots to do, learn and absorb. Despite spending more than 7 hours, another couple of hours would have helped us do justice to the place. To meet and hear experience of an astronaut, Nicole Stott, was awesome. Saturn V Centre was a treat. Great service, clear instructions, on time pick up. So glad we took this tour, it was an amazing experience, especially lunch with an astronaut. Our driver Giovanni was fabulous, and Julie who was in training was great as well... They didn't show any stress after running late to pick us up in the morning. Then on the way home, they kept us amused, right to the very last drop off point where we got off. Great job guys! Excellent tour, exceeded our expectations in every way except for the "Lunch with an astronaut" which was overcrowded and the buffet lunch was very ordinary for the price. KSC isn't a huge area so walking distances between displays are short. All displays are well presented. Don't miss the virtual reality Shuttle Launch Experience - but do it before lunch. Seeing the Atlantis up close was very exciting. Worth paying extra for the Discover KSC bus tour and the opportunity to see a launch pad and the Vehicle Assembly Buildings up close. Took two trips with Gray Line and was lucky to have Giovanni as our driver for both.. first was to Clearwater which is absolutely stunning and the second was to Kennedy Space Centre, which was a fabulous day out. Both trips were flawless, with the added bonus of Giovanni's humorous personality to break up the journey. Would recommend! Round-trip transportation A SPACE PASS - this includes entrance tickets, dine with the Astronaut and the Discover NASA tour. Lunch included within the Dine with an Astronaut program.